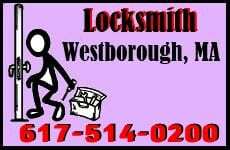 Bursky Locksmith Westborough MA has long been renowned as the best locksmith in Westborough MA for various reasons. The quality and care that our locksmiths put into all of our services is unsurpassed. We treat each client as if our business depended on their satisfaction; in a way it does. It only takes one unhappy client to spread the word that a business is lacking in a certain area. We make it our mission to ensure that each one of our clients leave our store either completely satisfied or at the very least more informed so that they can be confident in any decision that they make later on. We also make sure that all of our clients are given immediate and undivided attention. Our mission is to have all of our clients know that we are here to help them. Bursky boasts a wide range of Locksmith services, from re-keying to installation of delicate automated locks; we are your quintessential Locksmith. Bursky Locksmith Westborough MA is constantly on the lookout for new product to help keep your daily life more secure. We know that not every new item that goes onto the shelf is great, so we make it a priority to personally test out our inventory to ensure that the quality is of the highest caliber. Our employees are all trained in various specialties relating to the Locksmith trade. We are always on the lookout for new talent in uncharted waters. We recently employed Daniel, a graduate in Engineering; he brought with him the knowledge of the new age and the innovations of the future. Bursky Locksmith Westborough MA strives for perfection. However as we know, perfection isn’t always attainable. We here at Bursky do the next best thing, and that is to ensure that our clients have round the clock locksmiths who are ready to help them repair or install whatever is necessary. We believe in our products and only carry the best and most trusted brands. We want you to feel secure in your decision to use Bursky as your locksmith. We welcome all questions and critiques as we are here to help you and grow as a business. And a business cannot grow without the help and support of its clientele. Also, we love google + , so check us out!